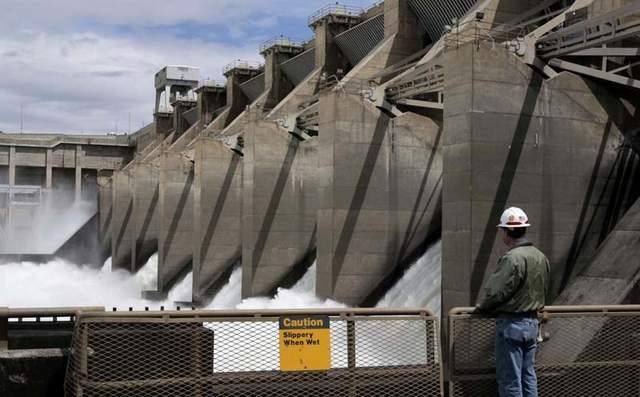 RICHLAND -- The lower Snake River dams have been a lot in the news again, thanks to Reps. Dan Newhouse (R-Sunnyside) and Cathy McMorris Rodgers, R-Spokane, and their fervent efforts to pass House Resolution 3144. The bill will subject any study, action or structural modification affecting hydropower capability of the dams to Congressional authorization, in a clear federal "over reach." I give them credit for wanting to preserve carbon-free electricity, but wonder why they are so opposed to the court-ordered increased spills. Salmon runs remain consistently low despite billions spent on trucking of fish, fish ladders, habitat restoration and other measures. Why continue to waste taxpayers' money in inefficient recovery efforts that have failed to move wild salmon off the endangered species list? The spills are a fair compromise that allows us to keep the dams and give salmon a chance at survival. The 97 percent survival rate across each fish ladder is misleading, as there are multiple dams to cross. So, the survival rate from first to last dam is much lower. Considering the warming river temperatures in reservoirs during hotter summers to come, more die-offs like the one in 2015 are likely. The cooler headwaters of Snake River at higher elevation offer a pristine habitat that represents the best salmon restoration opportunity. Why miss it? A recent poll shows a majority of Washington voters want to see increased wild salmon runs. Why ignore it?